Penn State football Coach Joe Paterno speaks Friday evening at the kick-off of "For the Future: The Campaign for Penn State Students." Photo taken by Annemarie Mountz of Penn State Live. Penn State's new fundraising campaign will aim to raise $2 billion by 2014, university leaders announced Friday evening. More than 1,000 donors and volunteers gathered for the public-campaign kick-off and dinner at the Bryce Jordan Center. University officials said Penn State has already secured more than $1 billion in contributions in the campaign's "quiet phase," which began in January 2007. The effort, called "For the Future: The Campaign for Penn State Students," is now in a public phase to raise the rest. It will conclude in June 2014. 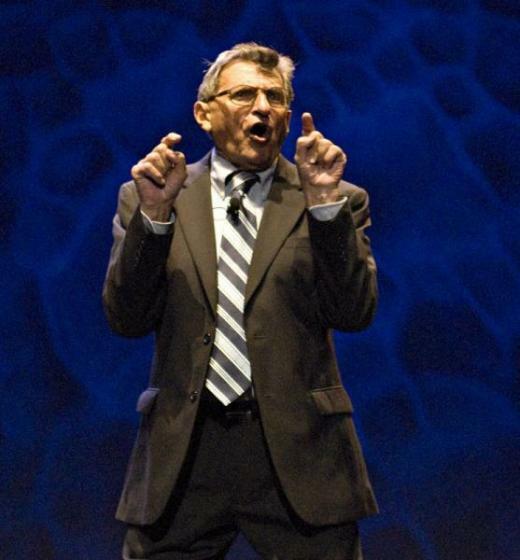 "The good news is, we've got the money," football Coach Joe Paterno told the invitation-only audience Friday, according to a university report. "The bad news is that it's in your pockets." With the overall target of $2 billion, "For the Future" has set the highest fundraising goal in Penn State history. Within the broader context of U.S. higher education, it's still a relatively ambitious number, but it's not unprecedented. The University of Virginia, for instance, is running a $3 billion capital campaign; Cornell University, a $4 billion campaign.The University of Michigan last year completed a $3.2 billion campaign. "Private giving has helped Penn State to rise to the top ranks of public institutions and take on the challenge of global leadership. And our graduates are making a difference in every field and profession, from business and medicine to education and the arts," volunteer campaign Chairman Peter Tombros said Friday, according to Penn State. "Thanks to philanthropy, the university is now recognized as an innovator and a leader, and when our students introduce themselves as Penn Staters, they are recognized as potential leaders, too," Tombros said. "For the Future" is the third Penn State fundraising campaign since 1984. The first, "The Campaign for Penn State," ran six years and generated $352 million. The second, "Grand Destiny," ran seven years and yielded $1.37 billion. It ended in 2003. Penn State leaders have said scholarships, honors education, research and faculty development are among the prime beneficiaries of the new campaign. Student aid is the top priority, according to the campaign. Penn State undergraduates who graduate with debt carry an average of more than $26,000 in loans. Watch for more in-depth coverage of "For the Future" on StateCollege.com in the days to come. For earlier coverage, see our report posted yesterday: Penn State to Launch Public Fundraising Effort. Penn State Spring Football: Who's Going To Win? Editor's Note: This is the final story of a 19-part daily series that answered questions surrounding the 2010 Penn State football team. Friday, we asked: "What Should I Look for at the Blue-White Game?" Today, we ask: "Who's Going to Win?"